How are dairy farms different today? Q: How are dairy farms different today, based on modern technology, compared to the days of milking cows by hand? A: Farmers don’t milk cows by hand anymore. Today most farms have milking parlors and can milk several cows at a time. Technology has improved dairy farming. My Grandpa milked cows by hand on our dairy farm with a stool and a pail. Then my parents milked cows in our stanchion barn using a strap over the cow which held the milking unit. Once the unit was full of milk they would dump it into a pail and carry the milk to the milk house. In the 1960s I would help carry the milk from the barn to the milk house and dump the milk into a strainer which looked like a giant funnel in the top of the milk tank cooler. The milk tank had an ice bank circulating cold water around the inside of the double wall tank to cool the milk. In the late 1970s, we put in a pipeline so we didn’t have to carry milk to the milk house and we upgraded to automatic takeoff milking units. The milking units transferred the milk through the pipes in the barn directly into the milk tank. The automatic takeoffs prompted the units to come off when the cow was done milking. Our newer milk tank with plate coolers uses well water to instantly cool milk to about 60°. Many dairies use glycol chiller’s to cool the milk instantly to 35° and pump it directly onto semi tanker’s that are well insulated so the milk can be transported far distances. In 2002, my brother and I built a milking parlor to accommodate 16 cows at a time. A milking parlor allowed us to stand in a concrete pit with the cows elevated on both sides for ease of putting on milking units (with automatic takeoffs). Today on other farms there are parlor carousels milking 80 to 100 cows at a time, which takes approximately 10 minutes per revolution. Some dairy farms use robots that can milk the cow whenever she wants to be milked, 24 hours a day with no one being there. This technology allows for much more efficiency and productivity. We now have radio frequency tags for each of our 150 cows which have the capabilities of tracking the production and other information for our cows. With the addition of readers we could monitor each cow’s time milked, her production, and a cow’s temperature and health so we know that she continues to be healthy. There are also rumination collars available which monitor their temperature, the number of times the cow ruminates and her activity, similar to a Fitbit. This tells a farmer how active she is to determine when to breed her and if she goes off feed to know she’s not feeling well. Newer buildings for dairy cows adjust temperature and humidity with airflow from large fans. Also farmers make it comfortable for cows to lie down in barns with various forms of bedding such as sand or newspapers. Some barns even have power brushes so the cows are also well groomed! Feeding cows has become much more efficient today based on technology. We used to feed our cows by hand with a wheel barrel and scoop for each individual cow. We now use mixer wagons to blend the feed and large skid loaders to feed a hundred cows at a time. Some of the newer dairy barns have installed robots to feed the cows. A final note: Technology is important on dairy farms, but just as important is keeping our cows healthy and comfortable. 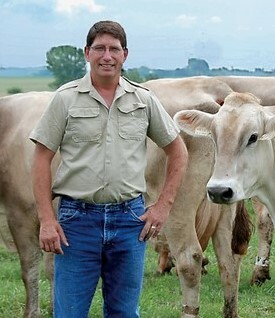 As dairy farmers we benefit, and our cows benefit too, from more advanced technology. Consumers reap the benefits as well because we are producing better quality milk today and more of it, so the price is reasonable.